Ouch. So what happened? Was it the stray shopping cart, or perhaps a mystery dent? Sooner or later it’s bound to happen, you are going to get that annoying minor dent. Even worse is when you are reminded of the dent every time you approach your car. Well there’s some good news, you may be able to go with paintless dent repair. Can I Get Paintless Dent Removal? In the case of a minor dent, there is a chance you can get paintless dent repair for your vehicle. Don’t let a different body shop convince you that you need paint done when you don’t. Our technicians will asses the minor damage repair that you need done, and decide whether it is in your best interests to go paintless or not. Need to get some minor dents removed? Click here to learn more. What if My Repair Needs Paint? No problem. Our technicians will examine the damage done and explain why you cannot go paintless. 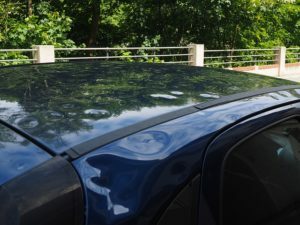 If this is the case, as experts in auto paint color matching, we can make sure that after you get small dent repair your car will be looking like new. We carefully blend the paint to make sure that the original surface matches the newly painted area. Even being off by the most minute shade or tint can stick out like a sore thumb. Don’t park near vehicles with large doors. Don’t park next to older damaged vehicles. Keep an eye out for stray shopping carts. Be aware of your turning radius when backing out. Park in your personal garage or carport. Always head-check before changing lanes. For minor dents you might be able to get paintless dent removal from one of our auto body shop technicians.